Big Data and analytics have been a hot topic in consumer-oriented businesses for years, but now new advances are bringing them to the chemical industry. These tools address the complete chemical manufacturing lifecycle from R&D to market, cutting the cost and time needed to bring a new product to market, according to Lux Research. 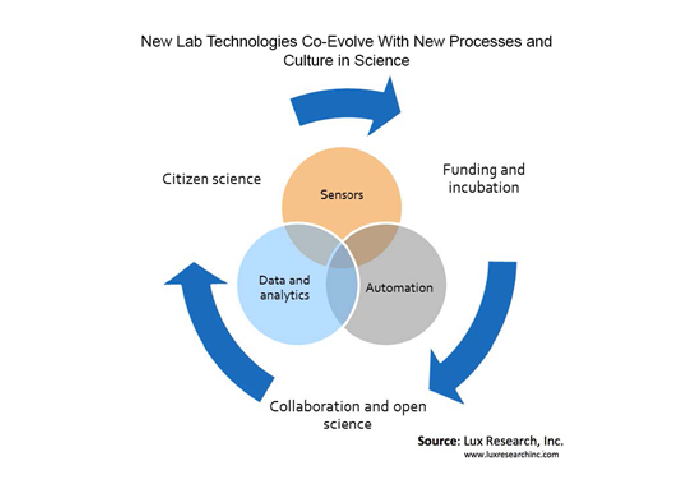 Novel sensors, materials and information technologies are making R&D more effective, integrating lab data with chemical databases and academic literature, and quickening the pace of innovation cycles. “Just as in the adage, ‘six weeks in the lab can save you an afternoon in the library,’ the growth of open science tools and data offers the biggest opportunity for advances, but challenging cultural changes must come first,” he added. •	Smaller, cheaper and better sensors are a driving force. In chemical research, room-sized instruments now fit a benchtop and benchtop tools fit a factory worker’s hand, allowing one researcher to do the work of a dozen. Further efficiencies come from cheap satellites and drones that gather data about chemicals in the environment. •	Software is key to lab management. Laboratory information management systems (LIMS) integrate lab data with chemical databases and academic literature, and also track inventories of reagents and consumables, status of samples, and even human resources data. With the availability of tablets and mobile interfaces, the benefits of LIMS are growing but have yet to be quantified. •	Automating design of experiments. Every step of the workflow is amenable to automation but design of experiments (DOE) is critical. With a single experimental run costing up to tens of thousands of dollars in time and materials, avoiding even a few worthless ones can justify the cost of automating the DOE process. The report, titled “Big Data and Analytics in Chemicals: From Cheminformatics and LIMS to Launch,” is part of the Lux Research Future Computing Platforms Intelligence, the Bio-based Materials and Chemicals Intelligence, and the Advanced Materials Intelligence services.